Our training is carefully designed and programmed to ensure that students, from the young child to the mature adult, build a strong foundation that will enable them to develop a healthy body and a clear mind. Warm Up and Stretching – It is extremely important to increase the blood flow into the muscles and to stretch the muscle structure prior to a training session. Our Academy uses numerous calisthenics and stretching exercises to accomplish this. Kicking Drills – These drills allow the students to not only practice the various kicks they have learned, it also increases the speed and flexibility of the leg muscles. Punching Drills – These drills condition the arms and shoulders for the speed and power needed to excel at Buk Sing Choy Lay Fut. Conditioning of Arms, Legs and Body – This conditioning is essential to the success of the individual’s training. The ability to not only block blows, but to deal out punches and kicks with speed, power and precision requires conditioning not seen in many other martial art forms. Choy Lay Fut Forms – The graceful, yet powerful forms that are learned at the various stages of Buk Sing Choy Lay Fut are the root of the practical application of this Martial Art. Self Defense Application of the Forms – As the student learns the basics of the kicks and punches, and develops the conditioning necessary, they begin learning the applied sparring techniques that are derived from the Choy Lay Fut Forms. Weapons – As the students advance through the ranks, they learn weapon forms and techniques. The first weapon is the staff, followed by weapons such as the broadsword, butterfly knives, spear and many others. Sparring – Sparring starts in the children’s classes, and is very carefully observed and controlled. As students advance through the ranks, the sparring becomes more intense and sophisticated. In the adult classes, sparring is controlled, full contact. Wooden Dummy – The Choy Lay Fut wooden dummy, or “Ching Jong” , had it’s roots in the Shaolin Temple. The Dummy is used to increase the toughening of the arms, footwork training, blocks and punches training and application of the various forms of Buk Sing Choy Lay Fut. Iron Palm Training – This training works and strengthens the palm, the back of the hand and the blade (edge) of the hand, and works in conjunction with the “Chi Gung” training. The Iron Palm technique, when properly learned and applied, can be a devastating blow. Chi Gung – Chi Gung is the training and development of “internal strength”, the ability to concentrate and focus the power of the mind and body. The ability to focus one’s strength and resist pain can lead to incredible feats of strength. Lion Dance – Lion dance is an important part of most traditional Chinese Martial Arts Schools. 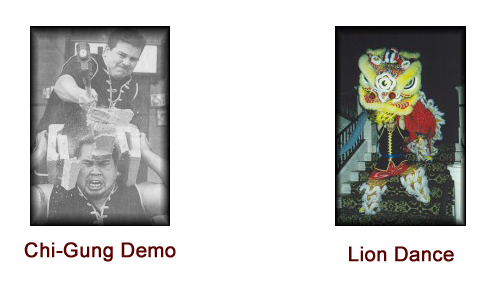 Our Academy teaches and practices Lion Dance, and performs at many functions. The main purpose of the Lion Dance is to ward off evil spirits and bring good luck. Buk Sing Choy Lay Fut Kung Fu develops both the mind and the body, and through different aerobic-type exercises, helps develop faster reflexes, greater flexibility, increased stamina and toned muscles. It also helps to improve coordination, breathing and leads to a healthier appetite. 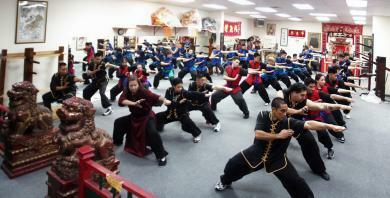 Kung Fu is a great way of releasing tensions and eliminating mental and physical stress. The practice of Kung Fu also gives one mental alertness, and a greater sense of responsibility. Besides all this, it is a highly effective form of self-defense and a student will gain self-confidence and discipline. Kung Fu helps to improve one’s character and concentration skills, therefore greatly benefiting a students grades and their attitude, both in and out of school. Kung Fu is beneficial to all ages, and a great method of weight control. Please click on the class name for additional information. Wing Chun – The Martial Art form founded by a woman, Ng Mui, a Buddhist nun. This style is the ideal form for close quarter combat, and is practiced by millions worldwide. Muay ThaiKick Boxing – Based on the Muay Thai style, these kick boxing classes not only condition the mind and body, they provide a useable self-defense form.